JAPAN is a market of major importance to Australia’s export-dependent beef industry, taking 29 percent of total Australian beef exports in 2017. Its importance as a market lies not just in the volume of Australian beef it takes, but the diversity and the value of the beef it buys. In addition to being a key market for manufacturing beef exports and offal, last year Japan bought 43 percent of Australia’s total chilled beef exports, and 52 percent of its total grainfed exports. After a long period of market dominance, Australia’s status as Japan’s number one beef import supplier is now coming under fairly serious attack. This is not only from the former market leader the US which has now gained full re-entry after a 10 year shut-out, but also from other exporting nations that have recently regained, or appear set to gain, access to the Japanese market (see our earlier article). Meat & Livestock Australia’s Japan regional manager Andrew Cox (above right) is the man in charge of efforts to protect and grow Australia’s share of the critical beef market. A major challenge for Australian beef in the past year was its higher price relative to competing product and the increased availability of some US cuts which helped the US to increase its market share in 2017. In a rare occurrence both Australian and US beef imports grew at the same time in 2017, reflecting the strong performance of the Japanese imported beef market. Australian exports grew five percent to 287,513 tonnes, while US beef exports grew 25 percent to 239,580 tonnes. (US export beef prices have kicked somewhat since late last year on the back of increased demand from China, since eroding its price competitiveness in Japan). 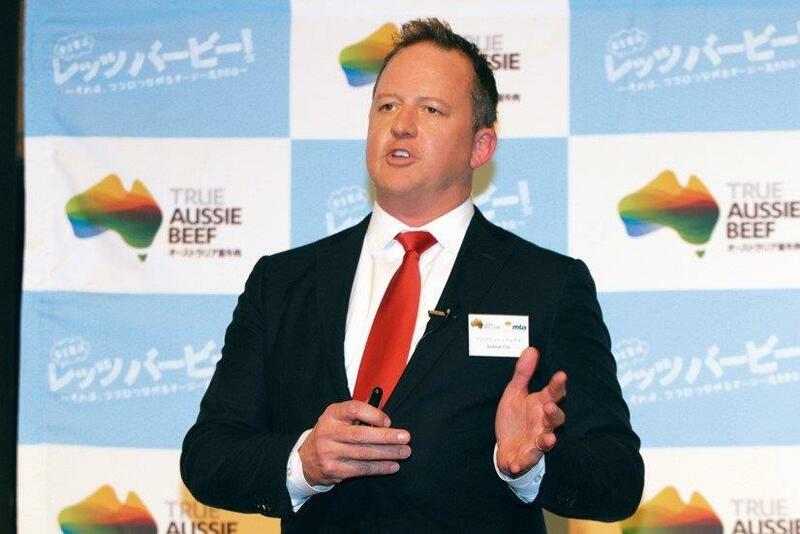 Mr Cox says Australian beef, even during market cycles when it struggles to compete on price, still has a number of key strengths in Japan, not least of which are highly valuable long-term relationships with major importers, which help to override economic factors alone. Market research repeatedly shows Australia holds a strong edge over other beef exporting countries in terms of its popularity and affinity with Japanese consumers. Australia is associated with quality and safe food production and occupies a positive position in the minds of Japanese consumers. When asked to identify which factors most influence their meat purchase decisions, most Japanese consumers name country of origin as the number one driver – well above key factors which tend to dominate in other markets such as price, meat colour and use by date. The fact that Country of Origin labeling of food at retail level is mandatory in Japan is beneficial for Australian beef in the market, given its strong standing with Japanese consumers. The challenge is to encourage Japanese retailers, who are responsible for how product in their stores packaged and branded, to invest the time and resources to ensure Australian product is prominently branded as Australian product. An integral part of MLA’s budget and marketing funds goes toward trying to encourage retailers to do this, supporting them with True Aussie Beef-branded stickers and material at point-of-sale, either standalone or combined with an exporter brand using industry co-marketing funds. Retail packs carrying ‘True Aussie Beef’ labels in a Japanese supermarket. “We know consumers are looking for our product, and this is why we take so much effort with the True Aussie brand, we want retailers to make it easier for customers to find our product,” Mr Cox explained. “We really promote to retailers that it is in their interests to use the logo, because their consumers are looking for Australian beef, and this sticker helps them shortcut to that product. One point of resistance to the take up of the True Aussie Beef logo is that not all retailers are willing to use the same branding as their competitors. Some prefer to develop their own branding for Australian beef to maintain a point of difference over their rivals. An issue for the Australian beef industry with this approach is the potential that exists for product to be promoted as Australian under a retailer’s own brand, but to contain cheaper beef from another source. An example of the old logo still in use. Nor is every retailer sufficiently organised, or prepared to invest the resources, to manually apply prominent country of origin stickers on every retail beef pack. Highlighting the ongoing challenge, one store Beef Central visited last week was still using the old ‘Aussie Beef’ logo instead of the new ‘True Aussie Beef’. Whether the retailer still had stocks of stickers printed years ago, or was printing new stickers using the old logo, which still carries some obvious cache in Japan after decades of promotional support, wasn’t clear. The flipside is that retailers can only access support from MLA where they are actively using True Aussie Beef branded material, which is a strong incentive to do so. The True Aussie Beef logo was launched globally in 2014. While Australian beef marketers in some other markets have faced the challenge of having to explain to consumers what “Aussie” actually means, decades of preceding Australian marketing work to promote the original “Aussie Beef” brand has helped the introduction of the new logo in Japan. Market research indicates that over 90 percent of Japanese consumers know that “Aussie” means Australian. To measure the rate of retailer compliance with the True Aussie Beef logo in Japan, twice a year MLA sends mystery shoppers into 500 retail outlets around the country. The anonymous shoppers record how much shelf space Australian beef has compared to its competitors, whether Australian beef has the True Aussie Beef sticker displayed and whether competing product is also identified by country of origin stickers. The results have been improving year on year, with the 2017 surveys showing that 73 percent of stores visited were applying True Aussie Beef stickers. Consumer awareness of the True Aussie Beef logo is also increasing, climbing from 18pc in 2014 to over 40pc last year. “Because we don’t have big budgets to run year-round national media campaigns, and we know most people see these logos on packs, this has been a really big push for us on the retail side,” Mr Cox said. Consumer trends which tend to favour Australian beef in Japan include the increasing number of western-style steak houses and the rising popularity of cooking steaks at home or at public barbecues. 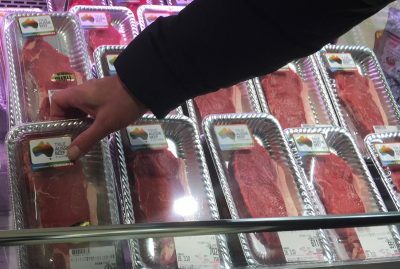 Tied in with this has been a noticeable increase in the number of Japanese consumers who express a preference for leaner, less marbled steaks, which they see as healthier and better for them. This trend also favours imported steaks over the more heavily marbled local Wagyu product. Australian beef has also benefitted from more favourable tariff arrangements in Japan compared to the US courtesy of the Japan Australia Free Trade Agreement and further concessions created by the newly signed Trans Pacific Partnership, of which the US is not a signatory. Chilled vacuum packed sirloins from G & K O’Connor and Kilcoy Pastoral Company in a Japanese supermarket last week. The listed price of 267 Yen per 100grams translates to a retail price in Australian dollars of AUD $32.50 per kilogram. Another key advantage for Australia is its food safety systems and the superior shelf-life of its chilled vacuum packed product. While some markets are happy to give Australia a shelf-life rating as long as 120-130 days, Japan remains very conservative in its preparedness to approve long shelf-life recommendations, and limits Australia to 77 days. However, this is still substantially longer than competing export product in Japan. Anecdotally, some importers who switched from Australian beef to more US beef because of the price differential last year are said to have now returned to Australian beef because of its superior shelf-life traits. “It is a really big selling point for Australia, our industry just has those systematic advantages,” Mr Cox said. Opportunities for beef marketing are also emerging through new trends such as the rapidly increasing number of Japanese women now working beyond marriage and childbirth, which has big implications for food marketing emphasising convenience, and big upcoming events including the Rugby World Cup in 2019 and the Tokyo Olympic Games in 2020.